Fashioned in the French Empire style and of that period these Italian commodes feature recessed marble tops above a frieze drawer and two deep drawers flanked by ebonized gilt bronze mounted classical columns. French with floral inlaid motif designs, late 19th century. Louis XV style. Bronze-mounted. Original marble top has a old repair. 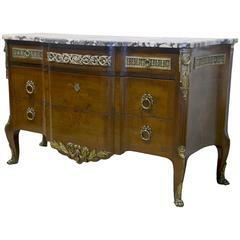 This elegant Biedermeier style chest dates to right around the turn of the century and features angled shaped corners, a beautiful shaped marble-top and honey colored fruitwood veneers.